Officially white chocolate cannot be called "chocolate" because it does not contain chocolate liquor. Good white chocolate contains cocoa butter, sugar, milk solids, vanilla, and lecithin. Make sure when buying white chocolate that it contains cocoa butter as some inferior brands contain vegetable fat. 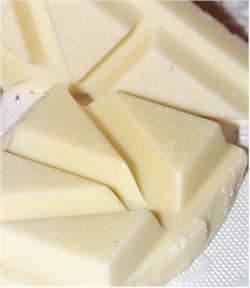 White chocolate is ivory-colored (white chocolate made with vegetable fat is white-colored) and is rich and creamy. Its sweet and subtle flavor complements other ingredients in baking. A delicate chocolate that scorches easily, so always melt over very low heat. It sets up softer than dark chocolate because it does not contain chocolate liquor. White chocolate will keep 6-10 months if stored in a cool dry place. There are many good brands of chocolate on the market today, both domestic and foreign. The brand I use most often is Lindt (found at grocery and specialty stores) although I do sometimes use Baker's (found at grocery stores).